Did you earn an NBRC credential in 2018? If you did, expect to receive a complimentary credential pin during your one-year anniversary month! As a credentialed practitioner, you consistently demonstrate exceptional knowledge and competence in respiratory therapy. 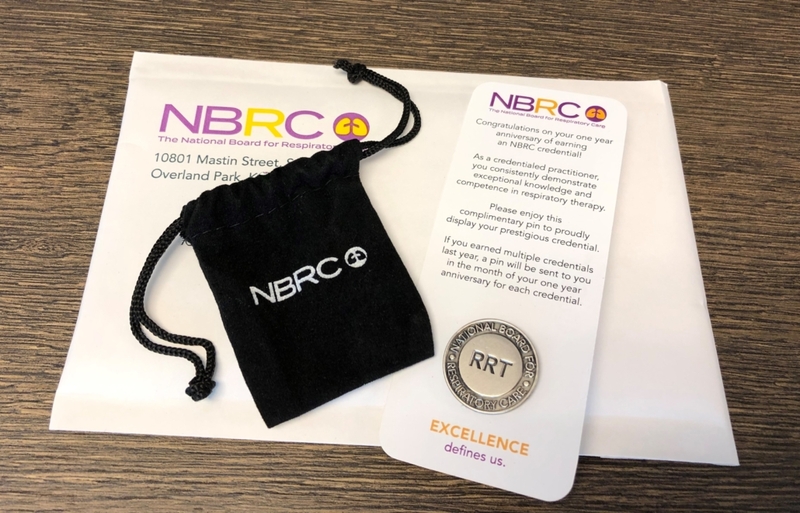 Starting new this year, we are celebrating your one-year anniversary of earning an NBRC credential by sending you a credential pin to proudly display your achievement – and you don’t have to do a thing! Expect to receive your pin during the month you earned your credential. For example, if you earned your RRT credential in April of 2018, expect to receive your pin in the mail by the end of April 2019! Enjoy the pins and don’t hesitate to contact our Customer Service Specialists at 913.895.4900 or nbrc-info@nbrc.org, if you have any questions.